IMAG0091, originally uploaded by f_a_h. We'll return to your regularly scheduled programming soon. Right now I've got to recover from what I call my New Orleans Hangover and get caught up on just about everything in my life and at work. 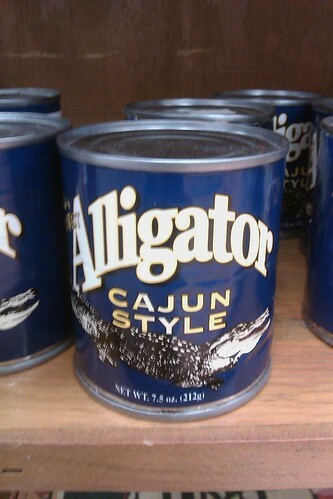 I tried non-canned Alligator when I was in New Orleans. It tasted like rubbery chicken. Much less terrible than I was expecting. Interesting...I'm with John, you should have brought some home! Meredith - agreed. It really tastes like chewy chicken. Alligator sausage is really good though.